The Practice wishes to expand its methods of communicating with patients to include the use of text messaging. This will enable us to contact you with reminders about appointments and other healthcare related information. We will only contact you by text if you have given consent by completing a consent form, even if you have already supplied us with a mobile number. If you wish to activate this service please complete a consent form and return it to the Reception desk. We are only able to offer this service to patients over 16 years of age with their own mobile phone number. The practice provides good access for disabled patients. If you are disabled or have any special requirements, please do not hesitate to indicate this to us. The friends and family test is a way of gathering anonymous feedback from you about your recent experience of the practice. Your feedback gives a very real and recent picture of what you think. You will have the opportunity to feedback every time you are in the practice, after an appointment or attending for administrative things such as repeat prescription or blood test results. As a patient registered with the practice you can give feedback after each and every contact if you want to. As a carer or relative you can also give feedback. You can choose to comment every time, sometimes or not at all. 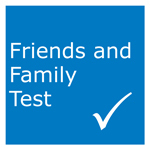 To complete the Friends and Family Test online, click the blue button above.